Description: This hydroid forms a crust on hermit crab shells and occasionally under rocks. Numerous pink athecate polyps arise from this crust. Extent of the basal crust is typically 20-30mm with individual polyps 5mm in height. 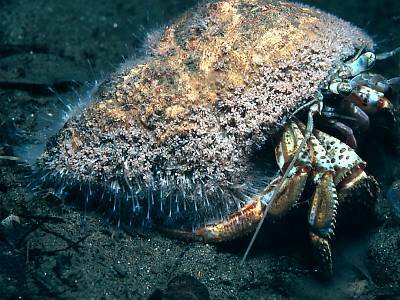 Habitat: Normally found on shells inhabited by the hermit crab Pagurus bernhardus in sheltered, muddy conditions. May also occur beneath rocks in the intertidal zone or on bedrock in the surge zone on exposed coasts. Distribution: Found all round the coasts of Great Britain and Ireland. Similar Species: This is the only pink athecate hydroid normally found on hermit crab shells. Pink polyps arising from a basal crust. Picton, B.E. & Morrow, C.C. (2016). Hydractinia echinata (Fleming, 1828). [In] Encyclopedia of Marine Life of Britain and Ireland.